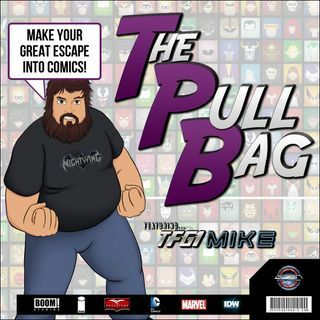 TPB Back Issue Classics Episode 86 is here! Cue Kenny Loggins because THIS IS IT !!! Mike and Ryan return to Talkin' Transformers... We are More Than Meets The Eye, we are Robots in Disguise! We conclude #AutobotlyApril 2017 by talking about the the final issues of More Than Meets The Eye and Robots in Disguise. We tease about #AUTOBOTLYAUGUST when we'll cover Transformers Punishment, Redemption, Salvation (3 trades 1 podcast), Transformers Sins of the Wreckers, Transformers Till All ... See More Are One Volumes 1-2, Angry Birds Transformers, and Transformers Titans Return!! So get ready for our final Transformers comic ep for now!! You'll only find it here inside The Pull Bag! TRANSFORM AND ROLL OUT!! As always Make Your Great Escape Into Comics!! !